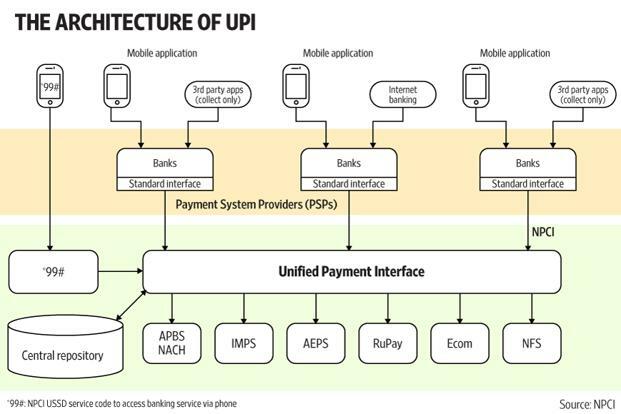 How the UPI(Universal Payment Interface) Works. The Unified Payment Interface (UPI) envisages a payments architecture that is directly linked to achieving the goals of universal electronic payments, a less-cash society, and financial inclusion, using the latest technology trends, laid down in the Reserve Bank of India (RBI) Payment System Vision Document (2012-15). The RBI document reveals that the number of non-cash transactions per person currently stands at just six per year; only a fraction of the 10 million plus retailers in India accept card payments; banking services were available in less than 100,000 villages as of March 2011; and nearly 145 million households are excluded from banking. Given this background, the National Payments Corp. of India (NPCI), which was set up in April 2009 with the core objective of consolidating and integrating the multiple systems with varying service levels, into a nation-wide, uniform and standard business process for all retail payment systems, undertook the task of implementing a UPI to simplify and provide a single interface across all systems. Considering the fact that about 150 million smartphone users exist in India today, and that the number is expected to rise to 500 million over the next five years, the solution leverages the growing presence of mobile phones as acquiring devices and uses virtual addresses instead of physical cards, thus reducing cost of both acquiring and issuing infrastructure. UPI is a cheap, secure, reliable, mobile-first, interoperable, open-source, instantaneous settlement and both pull and push platform, according to a note by Bengaluru-based technology product start-ups thinktank iSpirt. Moreover, while pre-paid wallets can’t do more than Rs.10,000 worth of transactions without KYC (know your customer) norms in a given month, a UPI-enabled platform bank account can transfer up to Rs.1 lakh instantaneously. Besides, the cost of each transaction is going to be less than Rs.0.45, and one can also factor in all the savings from, and to, bank accounts. (http://bit.ly/1SYOShJ). Now, one can use virtual/disposable accounts to do transactions generated right from the bank app. Through this, the merchant or the payee will not know your details and even if his system is hacked, you needn’t worry about losing money. Pull and Push amount can be requested from a certain account or paid into some other account. It’s one of the few systems in the world designed for the new mobile age, helping with easy integration across various platforms. Interoperable OTP (one-time password) generated on one bank app can be used across another for transaction authentication. Also, multiple level of identifiers can be used (bank account, Aadhaar number, virtual identifier, mobile number, etc) to send or receive money. Biometric integration gives a second factor authentication, securing your account like none other in market. Payment Support Providers (PSPs) can provide an add-on for easy-to-do recurring payments on top of UPI. Application Programming Interfaces (APIs) are going to be a game changer—they will ensure a level-playing field that will allow even a small start-up to do what big companies can. People who build the UPI switch. A switch handles authentication and communication between the issuing and acquiring banks. ‘Generation Two’ switches were card machines on the merchants’ premises; authentication was handled by the machine and the bank customers’ private PIN was keyed into the merchant’s machine, and needed an expensive leased line to operate. ‘Generation Three’ switches are UPI ones—they enable customers to key in PIN/OTP (one-time password) on his/her smartphone, while authentication happens centrally. One big worry is how to get banks to agree to connect to the switch. Those who connect to the switch. In UPI’s case, they are called PSPs. (Old players were called Payment Gateways but these are now passe.) There will be many PSP builders—some inside banks, many outside as start-ups and merchants. Technology worry: How to build a good PSP? What should I be focussing on? Business worry: How to get a bank to “adopt” my PSP as the primary PSP? Banks and customers are free to engage with multiple PSPs. The bank may have costs associated each time, while customers will only need to note down different addresses that will be associated with their identities on different PSPs. They connect to the UPI PSP, Visa/Master Card networks, RuPay or International payment gateways. They have to manage the user experience from the card to transaction completion. Technology worry: How to reduce failure in the underlying system? How to handle refunds? How to handle COD (cash on delivery)? They are called on-boarders. They have to sign up new UPI, or new wallet, customers. On-boarding has high failure rates and lots of clever hacks go into making that less painful. Technology worry: How to outwit others? Business worry: How to find touchpoints before the consumer gets to the cart to make on-boarding happen? They are the application guys. They bring new cash-out (e.g. recharge players like PayTM), cash-in (e.g. Eko) and social payments (e.g. MyPoolin). In the future, this is where the action will be. They have to be a destination site or integrate into existing payment experiences. Technology worry: How to integrate with others? Business worry: Are they “allowed” (as they are initially in the grey area from RBI perspective)? Enablers Innovative authentication collectors, E-sign, and digital consent are third-party systems that are needed by Level 1-4 people. An NPCI product, the Aadhaar Enabled Payment System (AEPS) offers instant, 24X7, interbank electronic fund transfer service through mobile phone. It allows Aadhaar biometric authentication-based transactions from a bank account that is linked with the Aadhaar number. The Aadhaar Payments Bridge System (APBS) is a system allowing remittances to be made to an Aadhaar number without providing any other bank or account details. It uses the NPCI central mapper as a part of National Automated Clearing House (NACH) to enable government user departments to electronically transfer subsidies and direct benefit transfers to individuals on the basis of their Aadhaar number. Currently, the NPCI central mapper has about 160 million Aadhaar to bank mappings in its database. As part of large scale adoption of Direct Benefits Transfer (DBT) across all subsidy systems, it is expected that mapping database will have about 200-250 million Aadhaar mappings within next 12-18 months. Payment Support Providers (PSPs), as defined by RBI, collectively cover all RBI-regulated entities under the Payments and Settlement Act of 2007. These include banks, payments banks, PPIs, and other regulated entities. In addition to the Aadhaar and the mobile number as global identifiers (mapped by NPCI), PSPs can offer any number of virtual addresses to customers so that they can use the virtual address for making and receiving payments. Immediate Payment Service (IMPS), launched on 22 November 2010, is now available to the Indian public from over 65 banks. The Unique Identification Authority of India (UIDAI) which issues digital identity (called Aadhaar number) to residents of India and offers online authentication service.